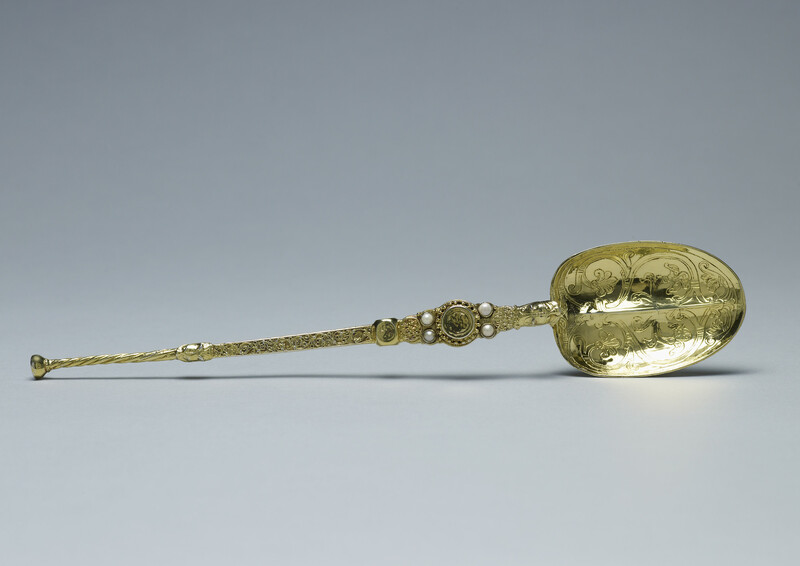 The silver gilt spoon has an oval bowl, divided into two lobes, engraved with acanthus scrolls. The bowl is joined to the stem by a stylised monster's head, behind which the stem flattens into a roundel, flanked by four pearls, and a band of interlaced scrolling, with another monster's head; the end of the tapering stem is spirally twisted, and terminates in a flattened knop. 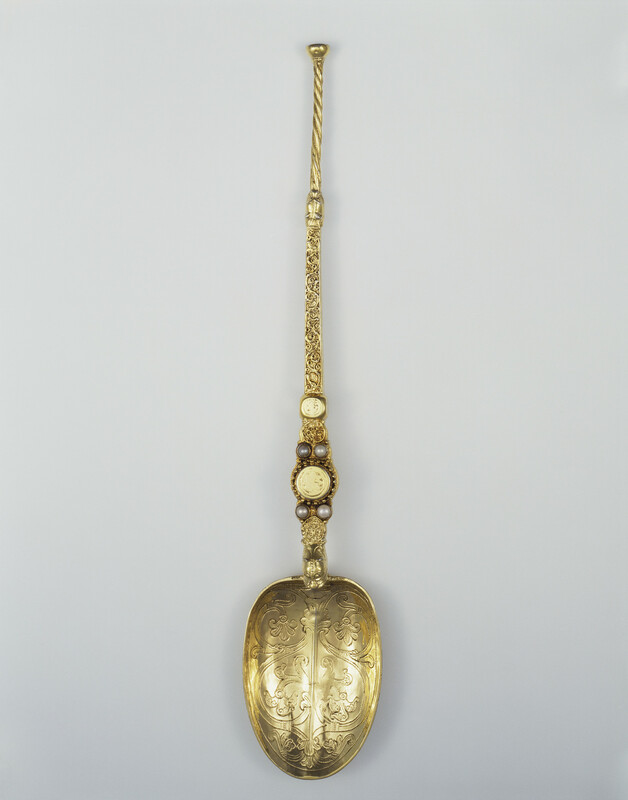 The spoon is first recorded in 1349 as preserved among St Edward's Regalia in Westminster Abbey. Already at this date it is described as a spoon of 'antique forme'. Stylistically it seems to relate to the twelfth century and is therefore a remarkable survival - the only piece of royal goldsmiths' work to survive from that century. It was possibly supplied to Henry II or Richard I. It is unclear from the 1349 inventory whether the spoon at this date was part of the chapel plate or simply a secular object. However, it was clearly never intended for eating or stirring. Its divided bowl and length suggest that it always had a ceremonial purpose, and its presence among the regalia means that it has always been associated with coronations. It may originally have been used for mixing wine and water in a chalice, but it was certainly used for anointing the sovereign during the coronation of James I in 1603, and at every subsequent coronation. One suggestion is that the divided bowl was designed in this fashion so that the archbishop might dip two fingertips into the holy oil. 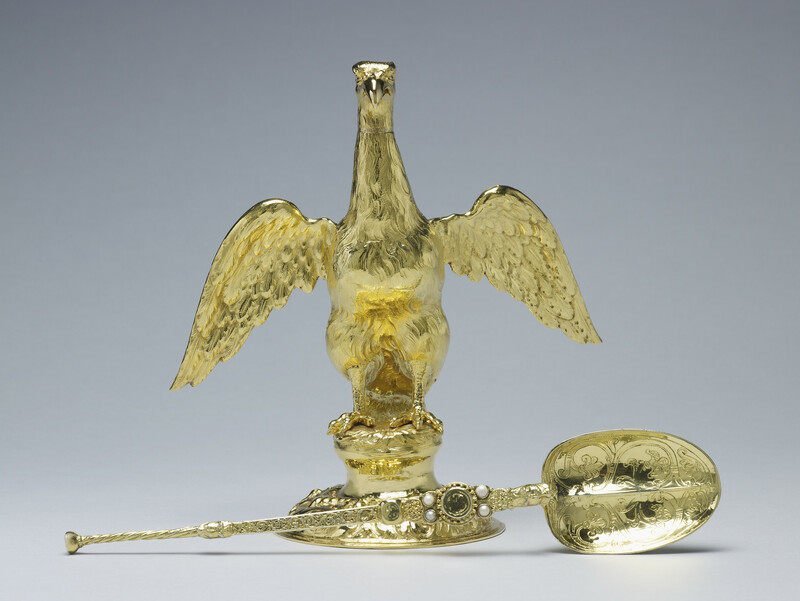 The spoon remained among the regalia until 1649, when it was sold off (rather than melted down like the other items). It was purchased by a Mr Kynnersley, Yeoman of Charles I's Wardrobe, for 16 shillings. 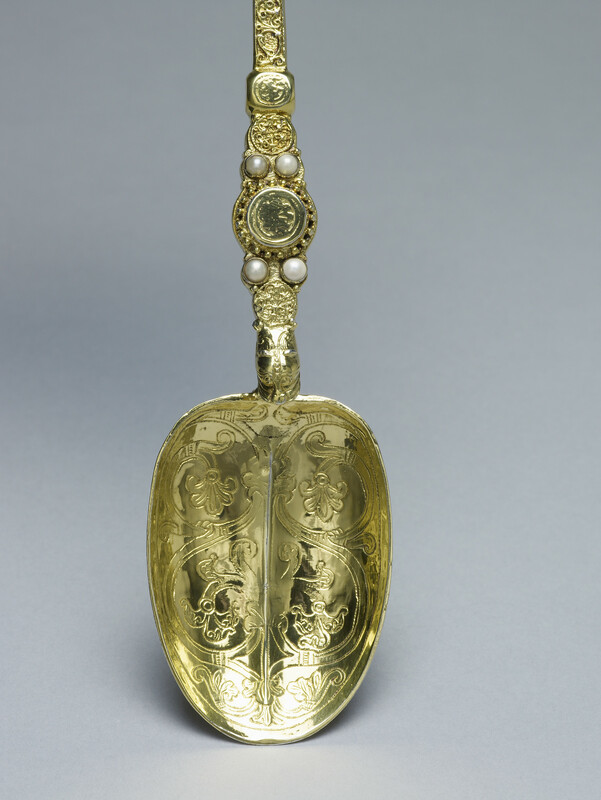 Kynnersley returned the spoon to Charles II, for use at the coronation in 1661, when the small pearls were added to its decoration. It has remained in use ever since. The anointing is the most sacred part of the coronation ceremony, and takes place before the investiture and crowning. The Archbishop pours holy oil from the Ampulla (or vessel) into the spoon, and anoints the sovereign on the hands, breast and head. The tradition goes back to the Old Testament where the anointing of Solomon by Zadok the Priest and Nathan the Prophet is described. Anointing was one of the medieval holy sacraments and it emphasised the spiritual status of the sovereign. Until the seventeenth century the sovereign was considered to be appointed directly by God and this was confirmed by the ceremony of anointing. Although the monarch is no longer considered divine in the same way, the ceremony of Coronation also confirms the monarch as the Head of the Church of England.